Mail Enhancer is a jailbreak hack app that adds a wide array of features to the iPhone Mail application. 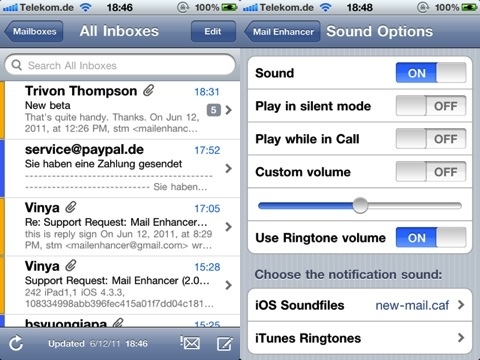 Developed by Stefan Mollenkamp, the Mail Enhancer mod requires iOS 4.0, and it recently added support for 5.0. Although iOS 5.0 includes many of the Mail features and tweaks users had clamored for, Mail is still one of the most lacking areas of the platform, and Mail Enhancer upgrades the experience considerably. Available in the Cydia Store as an iPod touch and iPhone app, Mail Enhancer’s greatest strengths are HTML support, highlighting, signatures and custom notifications. It even has quite hours for those notifications. That allows you to prevent unimportant email from disturbing you, but you can flag senders with VIP status so that Mail Enhancer notifies you regardless. The Mail Enhancer app is also extremely versatile. For instance, you can have an array of custom signatures. One of those signatures can be the default, which Mail Enhancer will add to the end of every composed e-mail without user interaction. You can also dictate signatures for specific recipients. This way, business associates get a different signature than Mom and she gets a different signature than your friends do. You can also add signatures to emails manually. As for ease of use, that’s a bit of mixed bag. The application has a setting for everything, and making any one change is not difficult at all. The one problem is that the sheer amount of app options is a bit overwhelming, and thanks to the tiered organization, you’ll find yourself doing a bit digging whenever you to need to change anything. You will use this hack a lot, so eventually you’ll get used to the organization of the settings, and then it’ll be a non-issue. We prefer Mail in general on the iPad simply because there’s more area for reading and composing e-mail. However, Mail Enhancer isn’t any less effective as an iPod touch or iPhone app because it integrates seamlessly with the built-in Mail tool. This is the big reason why we prefer Mail Enhancer to some of the other jailbreak alternatives available on Cydia. In fact, it’s so seamless we often find ourselves groping for Mail Enhancer features on iPhones with the default iOS. 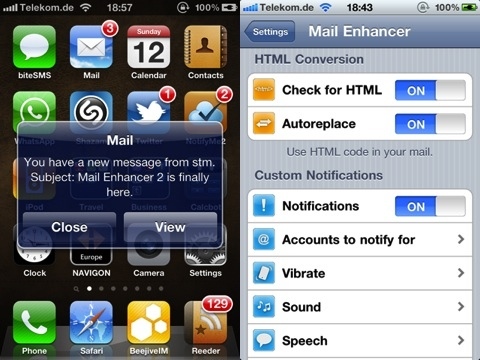 If you have a device that’s limited to iOS 4.0, then Mail Enhancer is a must-have program. If your device supports 5.0, then it’s not quite as necessary because 5.0 added notifications and other great features. Nevertheless, Mail Enhancer gives you much more control. You have notification banners, you can filter alerts and you can force them to the top of the stack. In other words, Mail Enhancer is a must-have for all power users. AppSafari review of Mail Enhancer was written by Joe Seifi on January 3rd, 2012 and categorized under Cydia Apps. Page viewed 4661 times, 1 so far today. Need help on using these apps? Please read the Help Page.